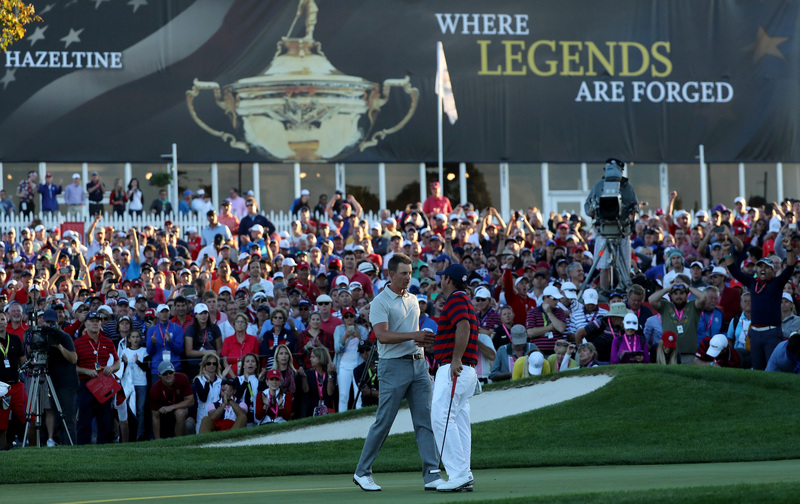 Sporting Traveller have been appointed as an Approved Operator for The 2018 Ryder Cup. The 2018 European Ryder Cup Team will be looking forward to getting back on home soil as they attempt to win the 42nd Ryder Cup which will be played at the beautiful, Le Golf National, just outside of Paris. This biennial team challenge is a favourite in the sporting calendar, a true festival of golf that captivates fans on both sides of the Atlantic. Drama, raw emotion and pure sporting theatre are the order of the day as the best golfers from Europe and America battle it out at the greatest team event in golf. We are offering Official Ticket & Accommodation packages including 5 nights hotel accommodation in Paris, 4 day grounds admission ticket, daily return transfers from your hotel to Le Golf National, Celebration Evening and Ryder Cup Gift. The tickets included with your holiday (standard admission tickets) include entrance to the final practice day, Opening Ceremony, the three match days and closing ceremony. Standard season tickets can be upgraded to Travel Club tickets, subject to availability and price supplement and should be requested at the time of booking. Travel Club Tickets provide the same access to the course as a standard ticket, but have the added benefit of providing access to a private covered area, providing seating and the opportunity to purchase food and beverages. The Travel Club also provides a sanctuary in the event of inclement weather or indeed an ideal meeting place. Make your way to Paris and your chosen hotel - normal check-in time is 3pm. Make the most of yoiur time and hit the streets and explore this wonderful city. Evening at leisure. Morning transfer to the course for the final Ryder Cup practice rounds. This afternoon join the large galleries of fans to attend the Opening Ceremony as the Captains get the formalities out of the way. Evening at leisure. Morning transfer to the course to see who the captains have selected for the opening Fourball matches, followed by the Foursome matches in the afternoon. Evening at leisure. Morning transfer to the course to watch the Foursome matches, followed by the Fourball matches in the afternoon. Evening at leisure. Morning transfer to watch the thrilling finale as all 12 players go head-to-head in the singles matches, followed by the 2018 Ryder Cup Trophy presentation to the winning team and Closing Ceremony. Evening at leisure. Check out of your hotel and make your way home. Situated 20 miles South West of Paris, Le Golf National has a rich tournament pedigree. Consistently considered to be one of the toughest tests in professional golf, the renowned L'Albatros course will host the 42nd edition of The Ryder Cup. Le Golf National will provide an amazing setting for both the European and American teams with many risk and reward holes on offer and plenty of water coming into play over the closing holes. A great course for spectators, where watching golf comes easy because of its natural stadium environment, everyone will enjoy a close-up view of the action thanks to its unique undulating layout. 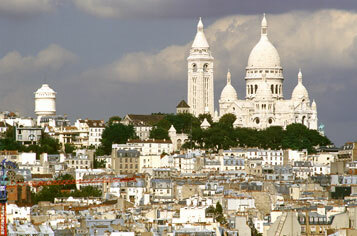 Paris is a seductive and exciting city and long term favourite with sports fans. Fantastic food, great wine and breathtaking sights all complement the ‘main event’ at Le Golf National. Paris is the Grande Dame of heritage, culture and art and the very name conjures up a multitude of images: narrow streets and smoky cafés, evening cruises on the Seine, dusty bookstalls along the Left Bank and Bohemian restaurants in the Latin Quarter. Is situated on the left bank of the River Seine and just across from the Eiffel Tower in an outstanding position and easy access to famous monuments, museums, shops and boulevards. 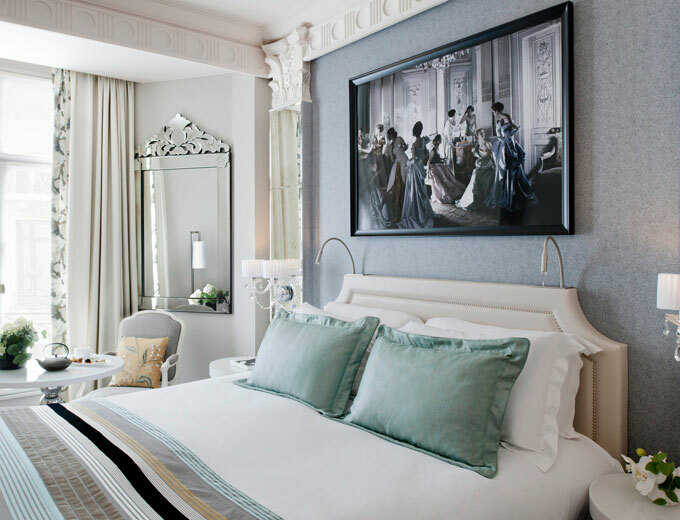 Awe-inspiring views of the Seine and the romantic City of Light are inescapable from the 764 hotel rooms which have all usual amenities and are decorated in light pastel tones and contemporary furnishings. Immerse yourself in Parisian lifestyle in the intimate and chic atmosphere of Bar La Seine or sample the sushi and authentic Japanese cuisine in the Benkay restaurant. The brasserie N’Cafe offers a simple and generous menu of seasonal products and excellent daily specials while L'Instant Nomade offers the 24-hour convenience for something sweet or savoury or a cold drink. Take a dip in the indoor heated swimming pool or work out in the fitness room. Opt for the intimate elegance of the Novotel Massy Palaiseau which lies in a gorgeous woodland setting, the hotel's lush green environment adding to the sense of escape. 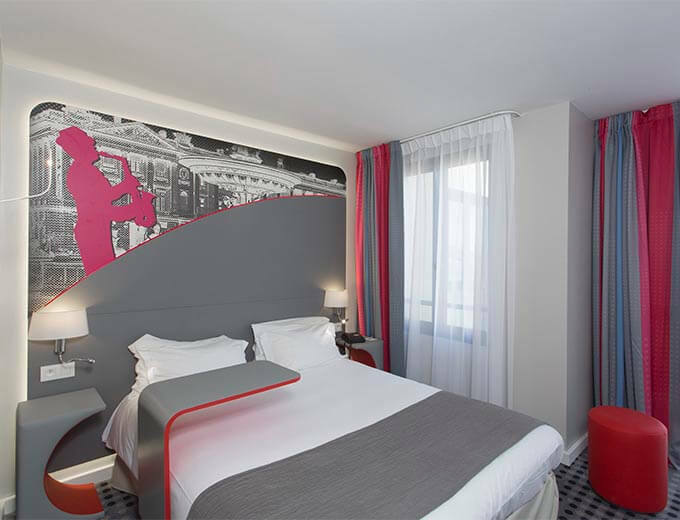 The hotel is just 15 minutes from Paris and within walking distance of the RER rapid train system and the TGV high-speed railway station so there is a choice of ways to explore the excitement of the capital and all it has to offer. 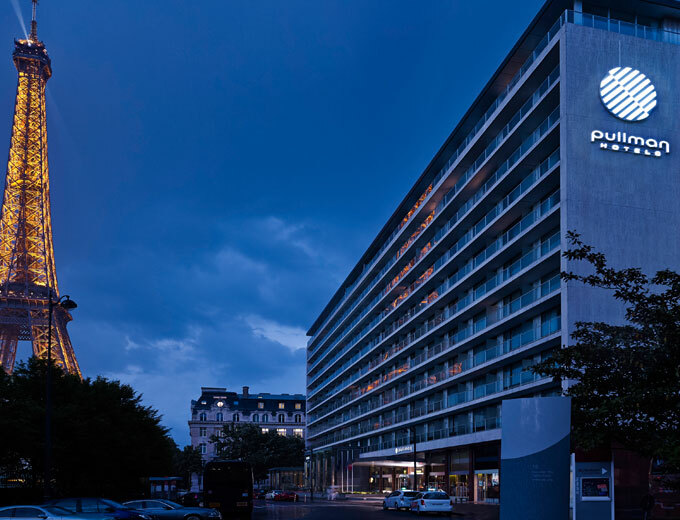 The Novotel Massy Palaiseau is close enough to central Paris yet offers a peaceful retreat. The hotel has 147 quiet rooms featuring contemporary designs and all are fully equipped for modern comfort. An outdoor swimming pool overlooks a landscaped garden and you can also admire the scenery from the tranquil outdoor terrace. Whether you desire breakfast, lunch, dinner or a tasty little snack, the Novotel offers balanced choices and a la carte service in a friendly, stylish setting. The hotel also has a large, private car park. Just a stone's throw from the Eiffel Tower, the Pullman Paris Tour Eiffel is a chic hotel on the Left Bank which has been completely renovated. The hotel offers comfort, simplicity and elegance in an enviable central location. 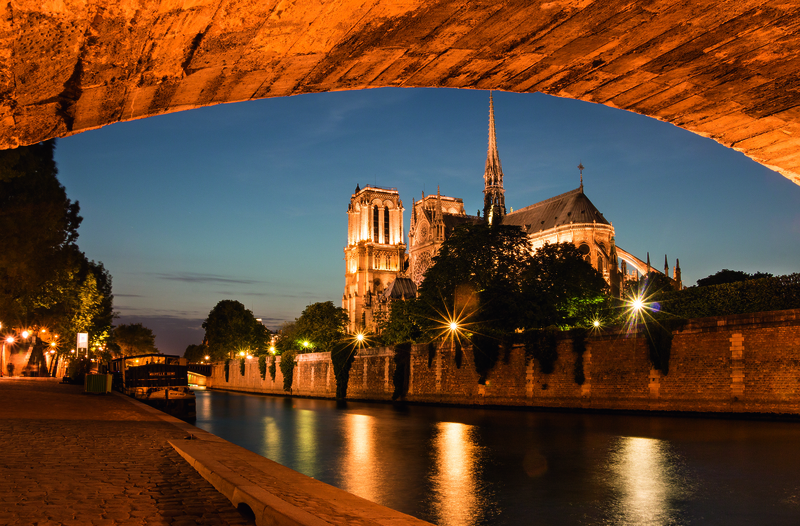 The Pullman is minutes away from major tourist attractions such as Notre-Dame, the Arc de Triomphe and the Bateaux Parisiens which provides stunning cruises down the River Seine. Decorated in a contemporary style, the bright guest rooms offer panoramic views of Paris. Most have a balcony, while some also have a breathtaking view of the Eiffel Tower or the garden. Stay active in the fitness room with its impressive view of the Tracadero before dining on the terrace at the restaurant Frame with its cosmopolitan atmosphere. The restaurant serves Californian-style cuisine with French flavours, a creative masterpiece which always earns diners' approval. The restaurant has an open-plan kitchen and a stylish wine bar. Explore the capital's wonderful heritage from the Timhotel Paris Place D'Italie, located in the heart of the 13th arrondissement with its magnolia trees and beautiful terraces. Here, you are just a short stroll from the lovely Butte aux Cailles village which retains an olde-worlde ambience through its charming cobbled streets. The famous monuments and landmarks which make Paris such a tourist hot spot are easy to reach, via excellent transport links. For instance, just 200 metres from the hotel is the Place D'Italie Metro station which provides direct access to the Champs Elysees. The Timhotel has comfortable and modern facilities, a vibrant atmosphere and an attentive team. Guest rooms are bright, fresh and functional and offer all the modern amenities to ensure a pleasant stay. A delicious buffet breakfast is served every morning putting guests in the mood for a day of watching golf or sightseeing. Nearby is the Italie 2 shopping centre and Chinatown. 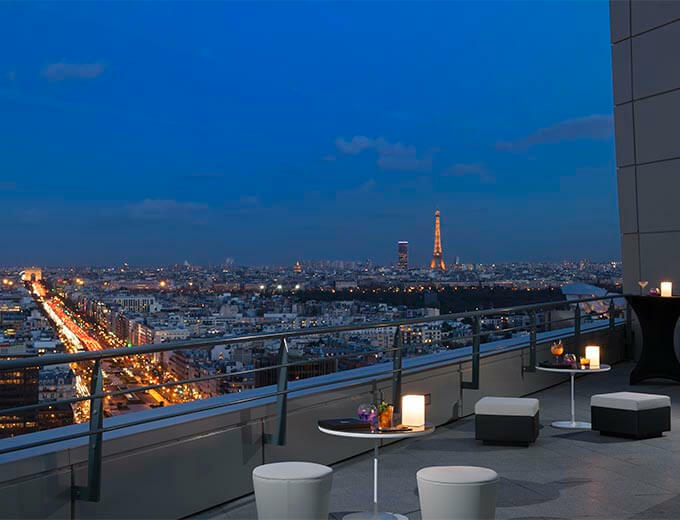 The Paris skyline is before you at the Melia Paris La Defense with its stunning design in the form of a ship's hull. This newly-built property provides spectacular panoramic views of the capital from its top floor Skyline Paris Lounge and Bar. The hotel, situated on the Esplanade near the Arc de Triomphe and other famous landmarks, is set in front of Takis water mirror fountains. 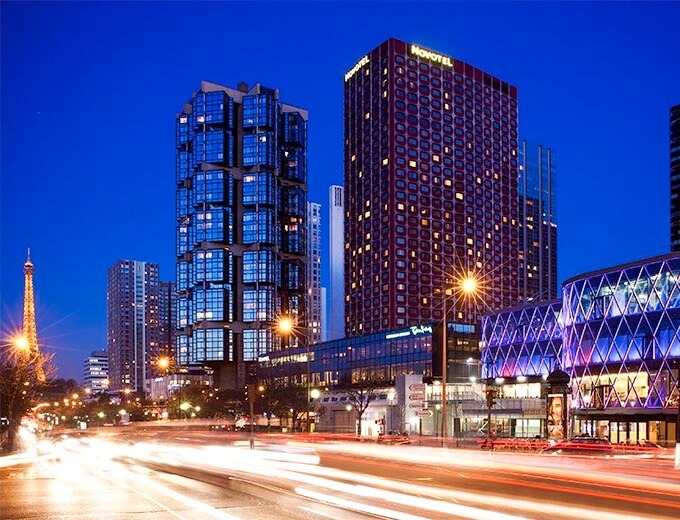 A direct underground connection provides easy access to the city centre and the hotel is next to Les 4 Temps, one of Europe's largest shopping centres. All rooms offer a superior standard of amenities and are generously sized, most with breathtaking views. The Level, spread over the top five floors, is a premium service with the ultimate feeling of Comfort and style. Le Miroir restaurant is a modern casual brasserie while The Place, with its outdoor terrace, is a casual dining restaurant. The 19th floor fitness suite has awesome views of the city. 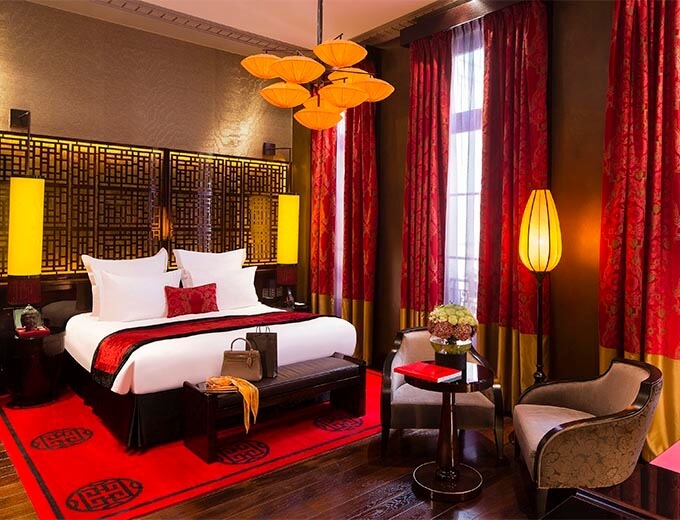 The Buddha-Bar Hotel Paris is an exceptional lifestyle boutique hotel in the heart of the ultra-chic Faubourg St Honoré, today considered the Paris Mecca of luxury fashion and haute couture.This little gem is located in a sumptuous 18th century building in one of the capital's most prestigious areas. Innovative and inspiring, the Buddha-Bar Hotel Paris reflects the very essence of the good life, offering an unforgettable experience that exceeds traveller expectations. Refined and sophisticated, the hotel's luxurious design celebrates the fusion between a Parisian mansion and neo Asian decor. Rooms and suites are situated around a courtyard, each possessing a soft and intimate atmosphere. The original menu of the Restaurant Le Vraymonde has a setting evocative of the Orient and extends into the courtyard, while the mystical and elegant Le Qu4tre was voted Best Bar in Europe for 2014-15. Feel rejuvenated in the wellness B/Attitude Studio with its treatment rooms and hammam which adjoins the fitness centre. 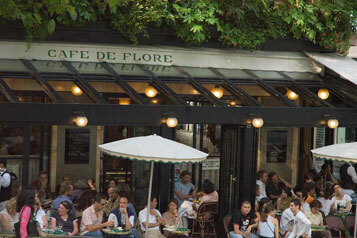 Right next to Gare Montparnasse train station and the metro lines, it is the ideal place for visiting Paris. If you want to stay closer to the hotel, you can enjoy the lovely Montparnasse district or savour a dish created by our chef Xavier at the N'Cafe! This hotel is situated in Montparnase. We have 188 rooms and 3 meeting rooms. You can find 6 metro lines near the hotel. Please call our sales team on 01737 244398 to check the availability of the holiday you would like to book. To confirm your booking we need to collect a deposit payment equivalent to 25% of the total holiday price. When making holiday payments we encourage you to pay online by bank transfer. We also accept credit & debit card payments. Your balance payment is due 12 weeks prior to travel and the due date will be shown on your confirmation invoice. The person signing the booking form will be treated as doing so on behalf of, and with the consent of, all the persons for whom the booking is made and is responsible for ensuring due payment of all monies. Please ensure you return your signed booking form, together with a copy of the photograph page of all passports as soon as you receive our written confirmation of your booking.